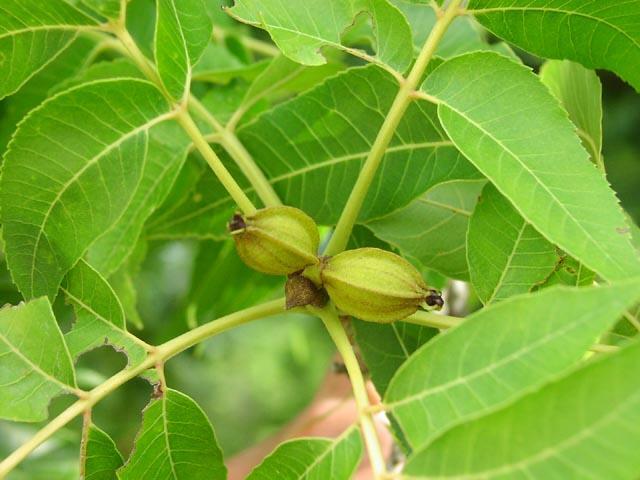 Pecan is a deciduous tree, growing to 25�40 m in height. Trees may live and bear nuts for more than 300 hundred years and is one of the largest of the hickory family. The leaves are alternate, 40�70 cm long, and pinnate with 9�13 (rarely up to 17) leaflets, each leaflet 5�12 cm long and 2�6 cm broad. The flowers are wind-pollinated, and monoecious, with staminate and pistillate catkins on the same tree. The Pecan trees are mostly self incompatible, because most cultivars, for being clones derived from wild trees, show incomplete dichogamy. So mostly two or more trees or different cultivars must be present to pollenize each other. The fruit is an oval to oblong nut, 2.6�6 cm long and 1.5�3 cm broad, dark brown with a rough husk 3�4 mm thick, which splits off at maturity to release the thin-shelled nut. The nuts of the Pecan are edible, with a rich, buttery flavour. They can be eaten fresh or used in cooking, particularly in sweet desserts but also in some savory dishes. One of the most common desserts with the pecan as a central ingredient is the pecan pie.In addition to the pecan nut, the wood of the pecan tree is also used in making furniture, in hardwood flooring, as well as flavouring fuel for smoking meats. A hot climate is required to mature the nuts properly. Pecans require a deep, well-drained soil and adequate soil moisture. Pecans are mainly propagated by grafting. Rootstck should be 1.5 to 2.5 cm diameter.